ATN timing belts from the MULCO EWIV Europe Group of Companies are not only one of the latest innovations of drive technology, they are also in the direct service of beauty. Every woman will know how to use an eye liner in order to bring a certain depth and expression to the eyes, but very few know just how fragile and difficult it is to move the core of this metal or cedar wood pencil with bare hands. It is therefore even more astonishing that a packing machine can handle the leads of the eye liner pencil so gently that even soft female hands can't improve on this. This process, developed into a real marvel of technology by Hans-Joachim Lortz, owner of the LogicPak in Hessian Dieburg, is called "sleeving" within the packing industry. "Sleeves“ are hose-type wrappers made of shrink-down plastic which protect fragile products such as the eye liner leads mentioned above as well as, for instance, plastic bottles with baby food or other fillings which should not be manipulated in any way by the trade. The tightly fitting, shrunk-down "sleeve“ can only be destroyed by force. As developer and supplier of these sleeve machines, LogicPak is one of the first ports of call whenever difficult products or those requiring protection have to be sealed partially or completely in a shrink-down film. The introduction of the innovative ATN timing belts in place of the previous chain drives and conveyors has turned these sleeve machines from Dieburg into an even more desirable product. Hardly has it been introduced on the market than the ATN timing belt is giving manufacturers of drive chains sleepless nights. 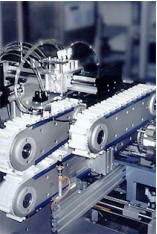 Developed by BRECO-Antriebstechnik Breher GmbH & CO, one of the most innovative producers in the field of timing belt technology and a member of the MULCO Europe EWIV Group of Companies, the ATN impressively demonstrates the possibilities further development of the tried and test polyurethane timing belt can offer. In co-operation with the MULCO-Europe EWIV member Hilger und Kern GmbH, Mannheim, LogicPak looked for and found a way to optimise the transportation, insertion and subsequent shrinking of the protective film in a hot air tunnel of tiny and fragile products, some of which are almost impossible to process by hand, from the cosmetics and writing implements industry. Up to 160 of the extremely fragile eye liner leads, measuring just 4 mm in diameter, are picked up per minute by the sleeve machine as gently as if wearing glacé gloves and transported to the sleeving station with flighted ATN 12.7 inch pitch timing belts. Not a single piece is broken, something just not possible at this speed if handled manually. Two mandrels, one to stop the product and one to carry the sleeve, then envelop the product as if by magic and transport it to the hot air shrink-down station. A brilliant idea - but it was the fast-growing market which promoted and demanded the rapid development of the design. New fields of application and products to be sleeved are opening up all the time. "Our technology makes it possible, by means of special retainers, to process products with an asymmetric and insecure surface“, states Hans-Joachim Lortz, showing sleeved ballpoint pen housings, cosmetic pencils or pharmaceutical products as small as a thumbnail. However, the chain drive of the machine did not meet the high demands of Hans-Joachim Lortz. Although no high torque and forces require transferring, the machine, controlled via 11 axes, should require even less maintenance and be even easier to operate, and should in particular be easier to set up for a change of format. This optimal solution from Hans-Joachim Lortz is offered by the ATN timing belt. Compared to other solutions such as welded flights or chains, for instance, the present application, combined with a two-part sliding flight system, provides exactly the right flexibility required by customers. The customer now has lower costs, because the personnel required for a format change only need to be instructed in the specific tasks, which is a lot cheaper than general training. 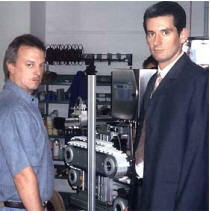 Here Hans-Joachim Lortz has a quite simple philosophy: “We have developed a module. Every operation should be foolproof in its execution. A change of format means red flights in, blue flights out or the other way round“. No time-consuming removal of chains and flights, making conversion of the machine for other formats and products a simple task. The operator simply slides the milled-to-size retainers on to the flights designed for the measurements of the product to be sleeved. The ATN timing belt pushed by the drive starts gently, does not require any greasing and maintenance and has a long service life. There is no question that particularly product sensible branches are happy at not having to grease the chain conveyor, particularly as the lubricant presents a considerable danger of contamination for the products to be sleeved. ATN lowers development costs in relation to time. Tests lead to sophisticated designs much faster. Based on the proven material composition of the PU timing belts and a good stock of standard dimensioned ATN 10, ATN 12.7 and ATN 20 belts in four widths, the application possibilities and flight shapes are only restricted by the creativity of the designers - but, as we know, this has no limit!